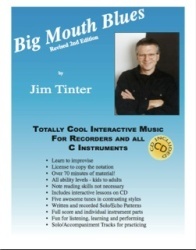 Big Mouth Blues is a totally cool, interactive music book and CD for recorders and other C instruments. Beginning with the notes B, A, and G, these five tunes in contrasting styles help students learn to improvise with solo and echo patterns. Includes full score, individual recorder parts, interactive lessons, and solo and accompaniment tracks on the included 70 minute demonstration/performance CD.